Most cases of upset stomach result from infection, food poisoning, overeating or motion sickness. Although the symptoms typically pass within one to three days, you may wonder how you can speed your recovery by choosing appropriate foods. 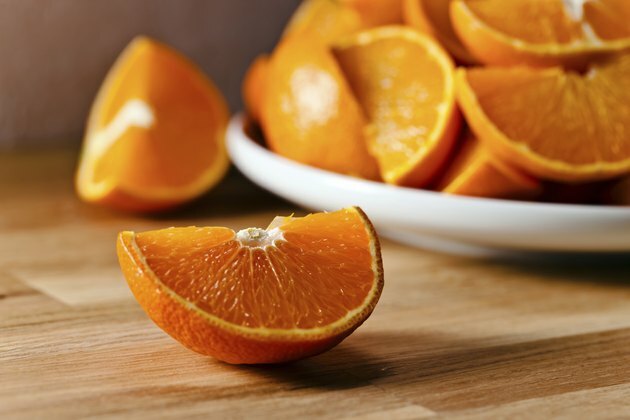 Although mandarin oranges are high in vitamins and low in fat, cholesterol or sodium, they are not a good choice if you have an upset stomach. Bland, low-fiber foods will help your stomach heal as you ease back into a regular diet. Signs of an upset stomach may include nausea, vomiting, diarrhea and stomach pain. However, you should contact a doctor if your symptoms include vomiting with a fever over 101 degrees Fahrenheit, vomiting together with diarrhea, or blood in the vomit. Mental confusion, rapid heart rate, severe abdominal pain, headache or neck pain may be signs of a more serious illness and should be evaluated immediately by a physician. You should avoid acidic foods, such as oranges and other citrus fruits, while you have an upset stomach. The high acid content of these fruits may irritate your stomach further. You should also avoid drinking orange juice or grapefruit juice until your symptoms have improved. Also avoid eating oranges or drinking orange juice if you have reflux, ulcers or heartburn. If you are actively vomiting, the American Academy of Family Physicians recommends that you avoid solid foods entirely. Take small sips of clear liquids until your vomiting subsides. To aid your recovery from an upset stomach, follow the "BRAT" diet of bananas, rice, applesauce and toast. These low fiber foods will help prevent diarrhea and the potassium in bananas replaces essential electrolytes lost during the illness. After 24 to 48 hours, you should be able to resume eating a more regular diet that includes fruits and vegetables. Virginia State University suggests sticking to bland foods, such as crackers, baked potatoes, boiled eggs and plain skinless baked chicken, for 2 or 3 days following an upset stomach. In addition, you should avoid high-fat and greasy foods for several days while your stomach continues to recover. Dehydration is a concern anytime you lose fluids by vomiting or diarrhea. Small, frequent sips of liquid are less likely to trigger vomiting than large volumes of liquid. Flat ginger ale, bouillon and clear juices, such as apple juice, are good choices. Older individuals and young children are more susceptible to the dehydrating effects of an upset stomach. Children should receive an electrolyte replacement drink, such as Pedialyte. Consult your pediatrician about the right choice for your child. Does Milk Calm an Upset Stomach?